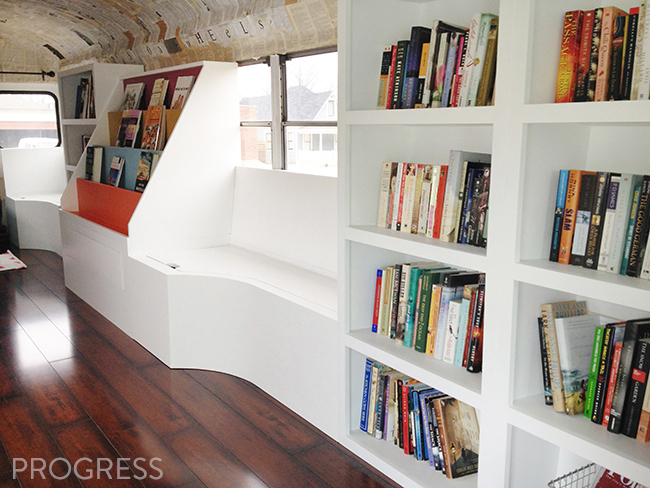 Sometime last fall a new client, Tina, contacted me needing help with design and space planning for the ultimate small space—a library on wheels. 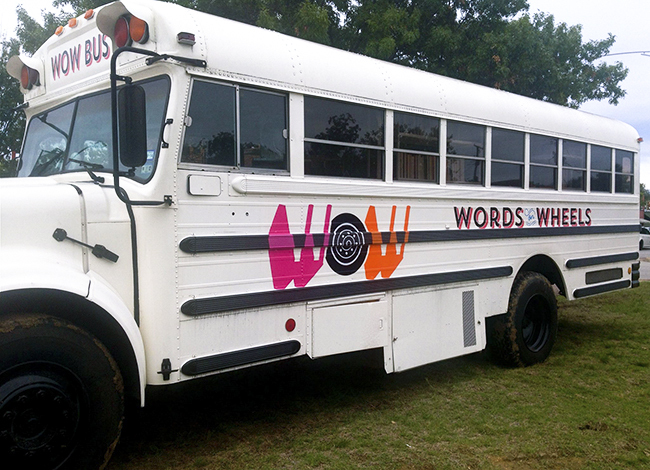 The WOW Bus is basically a reclaimed school bus filled with thousands of books and comfy seating that parks itself in various spots of Fort Worth, TX for the community to enjoy. I checked out her website and pretty much immediately decided I wanted to be involved. 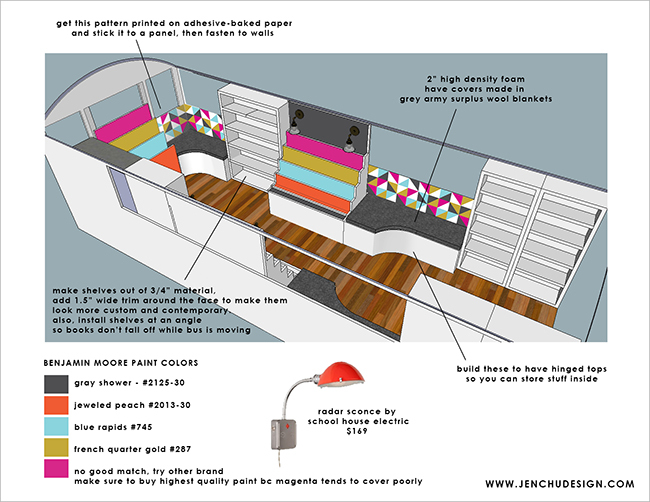 I love tiny spaces and have always secretly wanted to live in a pimped out R/V so I thought designing a bus would be right up my alley. 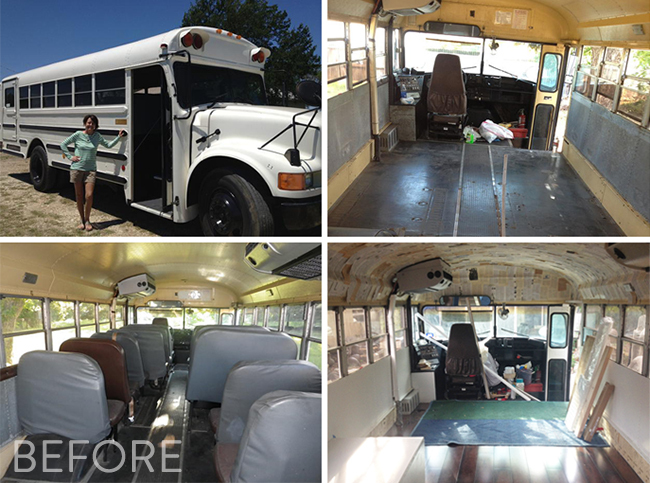 By the time Tina contacted me, she had already purchased a bus, gutted it, put hardwood floors in, and even had an air conditioner installed. This lady wasn’t messing around! 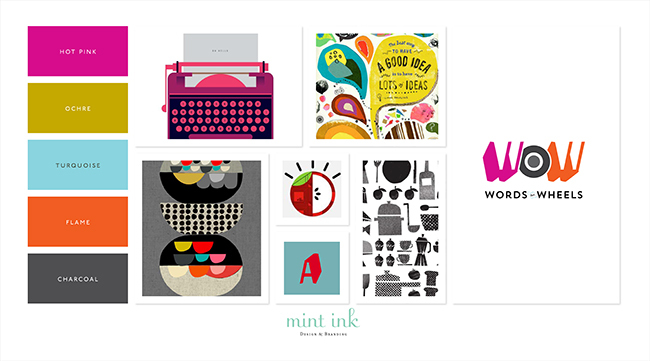 She already had a branding package put together by Mint Ink which was adorable and the perfect jumping-off point for a festive and fun design. Tina sent me the key measurements and I got to work right away. 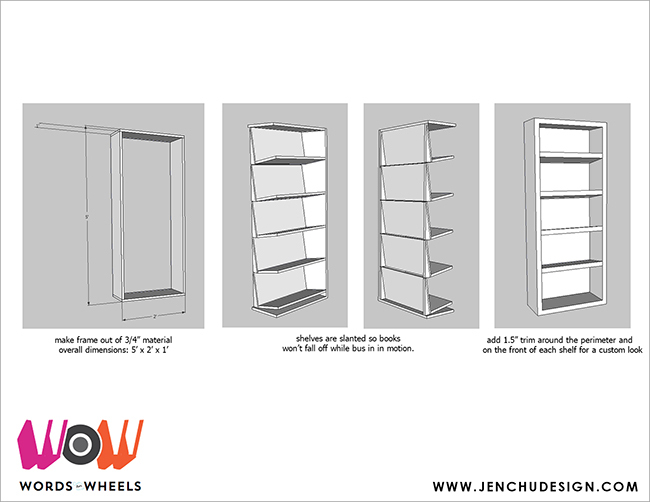 I drew a 3D rendering of the interior of the bus and sent her specifications for the shelves, benches, bookcases, etc. 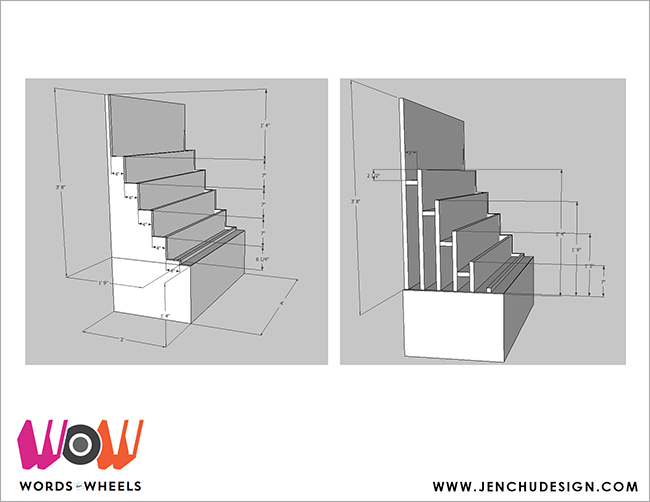 I knew the design I proposed was not going to be easy or cheap to execute, so when I emailed the final drawings to her, I wasn’t sure if it would be a couple months or a couple years before I heard from her again. One day in February, I opened my email and I was so happy to see these pics! All of these pics were taken by Tina, because we live thousands of miles apart. But man…I wish I was here to check out the progress in person! 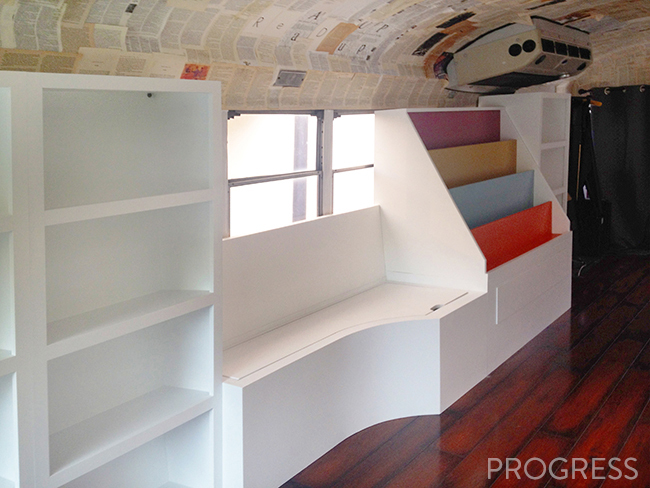 I’m so impressed by Tina’s gumption and determination—I know how hard it is to get a project like this off the ground. There have been several instances when I collaborated with folks with really wonderful ideas, and the projects either lost steam or changed course and the project got put to rest indefinitely. 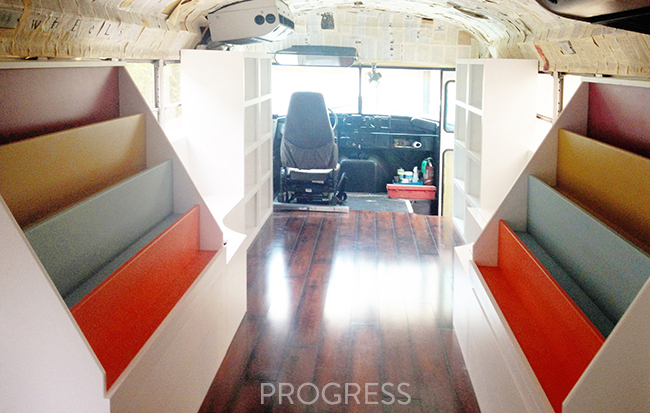 I’m so glad that this project is thriving and looks AWESOME so far. What a great idea! Nice work! this is beyond awesome. I love the ceiling. Real nice job Jen. 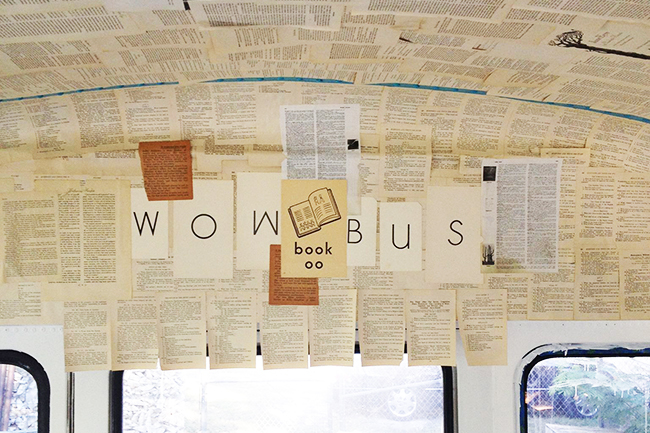 Awesome work for an awesome idea.